These next Air Force Scrapbook Layouts contain photos of some of the aircraft and equipment on display. 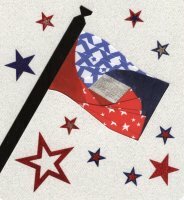 The lettering is the same Red, White & Blue Stickers as used on the Thunderbirds layouts. 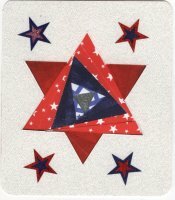 The two embellishment cards with the Flag and Star are made with a technique called Iris Folding and various sizes of Star Stickers. Here are some close-up's of the Iris Folding Technique. All the items on this Air Force Layout are from the Combat Camera Squadron. 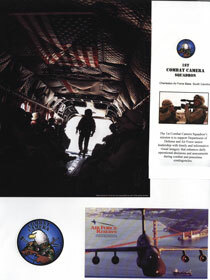 The purchased photo of Airmen inside an aircraft, the Combat Camera decal, a post card and the brochure from the Combat Camera Squadron. Here's a link to the First Combat Camera Squadron to learn more about what they do. And here is a video with some more great information. 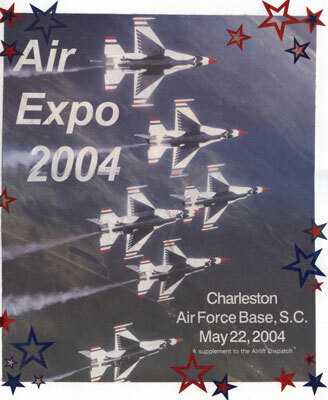 One more layout made from the program from the Air Expo - mounted on a white back ground paper and decorated with more of the metallic star stickers. The Heritage Makers pages for Memory Book Architects.